Whilst covering the trial of Nazi war criminal Adolf Eichmann in 1961, political theorist Hannah Arendt, herself a Jew who had fled Hitler’s Germany in 1933, coined the term “the banality of evil”. The origins of the term are intrinsically linked to Eichmann and his role in the Holocaust. In contrast to the central, decisive and influential figures within the Nazi hierarchy, Eichmann merely headed a department charged with organising the logistics of moving Jews across Europe, more often than not to extermination camps. What made Eichmann such a pivotal cog in the Nazi machine was that he was wholly unremarkable. In a recently published letter to the Israeli president, Eichmann, facing trial and probable execution, pleaded “There is a need to draw a line between the leaders responsible and the people like me forced to serve as mere instruments in the hands of the leaders…I was not a responsible leader, and as such do not feel myself guilty”. This excusing of his actions, due to the fact he was a mere puppet coerced into aiding the Nazi cause rather than a willing participant, was what Arendt saw as the “banality of evil”. Whether or not caveating your involvement in a wider evil as simply doing your job is excusable or not is another matter, however for Spotlight the issue of banal evils is absolutely central to its story. Rather than mass genocide, Spotlight illuminates The Boston Globe’s investigation and reporting into the paedophilic actions of clergymen within the city’s Catholic community. The film has strong echoes of All the President’s Men, which focused on the Washington Post uncovering the Watergate scandal, in its execution, but it’s this thematic examination of the “banality of evil” and the role of guilt that makes Spotlight far more compelling than the basic premise. The central thread of Spotlight is how the eponymous department of the newspaper unearthed a story of the century style coup thirty years in the making. For the most part, this endeavour boils down to the star studded journalist team of Michael Keaton, Mark Ruffalo, John Slattery and Rachel McAdams shifting through paperwork and coaxing facts out a host of reluctant witnesses. In that sense it’s a rather straightforward film that works logically from point A to point B. Editor Tom McArdle plays a key part as he stiches the mystery together in a logical and succinct pattern, eventually succumbing to one of those classic fast moving montages featuring journalists being turned away from endless house calls. There’s little sensationalism in Spotlight’s story. Even the biggest revelations about the levels of depravity, entombed in the apparent sanctity of the church, are presented in understated utterances, almost slips of the tongue. When the scope of potential abuse is blown wide open it’s done over the wholly undramatic and impersonal medium of a conference call. Director Tom McCarthy treats the story in equal measures of delicacy and bluntness which fits perfectly with the grave subject matter. At no point is the abuse sugar coated, nor is it dressed up in cinematic turns that would lend to cheapening. Approaching the film with a realist lens successfully juxtaposes the mundanity of the everyday with the horrors lurking behind this façade. Similarly, cinematographer Masanobu Takayanagi is unlikely to have shot anything quite as bleak and bland as on Spotlight. The film almost solely resides in uninspiring offices, barren corridors and generic streets. None of Boston’s photogenic landmarks are present, and frankly Spotlight’s cautionary tale could take place in any urban sprawl. The colour palette is similarly drab with grey skies presiding over a marshy deluge of greens and browns. Of course, Takayanagi isn’t crafting a dazzling spectacle; he’s enforcing the banality of Spotlight’s world. 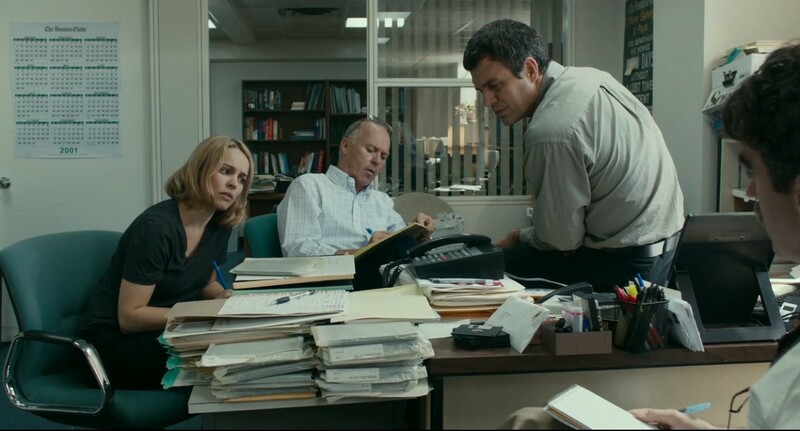 The Boston portrayed isn’t a fertile breeding ground for acts of unthinkable evil, instead it’s a slice of the everyday we can all relate to – that’s what’s truly shocking about Spotlight. Even the eye catching ensemble cast aren’t afforded overly expressive or domineering performances. It’s a strange paradox by where the roles could be played by anyone, but to act with such discretion requires brilliant actors capable of convincing anonymity. This subtle excellence is epitomised by Mark Ruffalo’s awkward and twitchy turn as Michael Rezendes. His character is littered with nuanced ticks that inspire a level of authenticity often overlooked. However, what truly stands out is Rezendes’ humanity. Confronted with the idea that religious abuse is all around him he lapses into an outpouring of grief, horror and, most poignantly, guilt. While less eye catching, Keaton is excellent as Editor Walter “Robby” Robinson. His stern exterior hides a questioning fragility about whether, in his privileged position, he’s allowed this abuse to exist over his investigative, prying eye too long. When under pressure from Keaton’s increasingly hostile line of questioning, Catholic attorney Jim Sullivan (Jamey Sheridan) defensively retorts “I was doing my job”. Keaton simply replies “Yeah, you and everyone else”. The exchange has ominous and deliberate echoes of Eichmann’s earlier sentiments. While the holocaust occurred under the exceptional abyss of WWII, Spotlight’s religious evil hides in the broad daylight of the unexceptional. It’s this consistent focus on the mundane and the banal that contrasts so powerfully with brutal first-hand accounts of priests sexually abusing children. Spotlight doesn’t beat its audience down with excessive gratuity, rather it unsettles us immensely by questioning are own innocence, innate guilt and faith in the world around us.